For more information on MYN and ClearContext, see our TWC partner page. Download our free Outlook GTD setup guide here. If you’re looking for a free Outlook-based alternative to Gmail’s Smart Labels, give ClearContext Personal a run. Posted by brad at 10:40 am on March 15th, 2011. To better support our GTD customers, we introduced the Context Category dashboard in v5.4. Now you can use the Dashboard to review your To Do’s by category, project, next action and/or date. Here are some of the more significant changes from our GTD Setup Guide. From the Context Category view in the Summary Dashboard, double click a context to quickly jump to your action lists (@Work, @Phone, etc.) or a list of all Next Actions. From the Project view, pin the projects that are most important to you. Identify Next Actions by Project. Double click a project name to take notes and display all related tasks, appointments, contacts and files. Process the inbox using the ClearContext workflow buttons (task, schedule, defer, etc. ), answering those emails that you can, deleting those that you don’t need, filing reference material using ClearContext File buttons, and creating tasks or appointments for future work. As tasks and appointments are created, assign a category context using Outlook’s native category assignment feature and one the categories created above. This will automatically associate the item with the appropriate action list. Select a Context Category view from the Summary Dashboard menu (Active in the image to the left). Double-click !Next to open the Next Actions Detail Dashboard, showing all tasks designated !Next. This allows you to focus on those tasks that are most important to the progress of your Projects. The top half of the Dashboard allows you to quickly see which Context Categories or Projects require your attention. Select either a Context Category or Project view of tasks via the menu at the top right of the Dashboard (Active in the image to the right). The Context Category view only displays categories with special characters in front of them (i.e. @Phone). The large count to the left of each category indicates the total number of due tasks. Counts highlighted in red indicate categories with overdue tasks. Double-click to open a list of all tasks for the selected category. Double-click !Next to see all tasks that have been marked as Next Actions. Double-click <Unassigned Tasks> to open the Organizer and view a list of all tasks that have not had a category assigned to them. When viewing Projects in the Dashboard, large counts to the left of each Project give the total number of due tasks, highlighting in red those Projects with overdue tasks. Projects with Next Actions assigned show a small arrow next to the Task count. Use the pin icon to pin your most important Projects. To view only pinned Projects, select a view from the Project header (Active in the picture to the left). Double-click <Unassigned Tasks> to view all your tasks without Project assignment. Double-click individual Projects to open a Project Dashboard. The Tasks and Appointments section of the Summary Dashboard shows all of your Tasks across projects and Categories. Use the filter selector in the header (All in the picture to the left) to filter by date or priority. When ready to focus on a single context (i.e. @Phone) or a single project, open a Detail Dashboard. The Due Date and Priority buttons at the bottom of the Dashboard can be used to quickly change task information. Highlight multiple tasks and click the Due Date button to change the date due for all selected tasks. 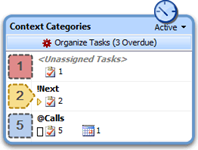 Assign Next Action, Date and Priority by right-clicking a Task. When ready to focus on an individual project or category, open the Detail Dashboard by double-clicking a Project or Context Category in the Summary Dashboard. When viewing the detail for a Context Category, ClearContext displays all tasks and appointments with the current category assigned. When you’re ready to work on a single context/action list (i.e. @Phone), this is the place to do it. As in the Summary Dashboard, right click a task to assign Due Date, Start Date, Priority or Next Action. In the Project Detail, add project related notes and view all tasks and appointments assigned to the Project. Use the Change menu in the Project header to quickly open pinned Projects. Click Folder to open the associated Project folder. Move or Pin a Project from the Actions menu. As in the Summary Dashboard, right click a task to assign Due Date, Start Date, Priority or Next Action. Click the Files tab at the bottom of a Project Dashboard to view all attachments that have been emailed for this Project. Click the Contacts tab to view all Contacts you have corresponded with for this Project. Download our complete GTD setup guide, Using ClearContext Pro for Microsoft Outlook with Getting Things Done. See What is GTD? to learn more about the GTD system. GTD and Getting Things Done are registered trademarks of David Allen & Company. ClearContext Corporation is not affiliated with David Allen & Company in any manner. Posted by brad at 9:35 am on March 9th, 2011. Since early releases of ClearContext, we’ve always had a significant group of passionate users who are also fans of productivity systems like Getting Things Done and Total Workday Control. We’ve had a special build customized for our TWC users for a while. We’re now pleased to announce the release of ClearContext Pro v5.4, which includes some much-requested features to better support our GTD users as well. Context Categories – You can now manage your tasks based on either categories or projects. Select a category view on the ClearContext Summary Dashboard to display a count of tasks and appointments by context category in the dashboard, highlighting due and overdue categories. Context categories are denoted by a special character in front of the category name (i.e. @Calls, !Next, *Phone). Category Dashboards – Double-click a context category on the Dashboard to open it in the Detail tab (formerly the Project tab). This will show all tasks and appointments with the assigned category. Add new tasks to the category using the Add Task function on the detail dashboard and ClearContext will automatically append the current context category to the task. Next Actions - Right click tasks in the Dashboard or Organizer to mark them as Next Actions. A small arrow will appear next to those items you have identified as Next and a category of !Next will be assigned to the task. Use the Next Action filter on your task list in the Dashboard to see only those tasks marked !Next. More details on these and other GTD-related features can be found in the GTD setup guide. The v5.4 upgrade is complimentary for registered v5 customers, registered v5-TWC users and active Connect members. Download here. GTD and Getting Things Done are registered trademarks of David Allen & Company. ClearContext Corporation is not affiliated with David Allen & Company in any manner.